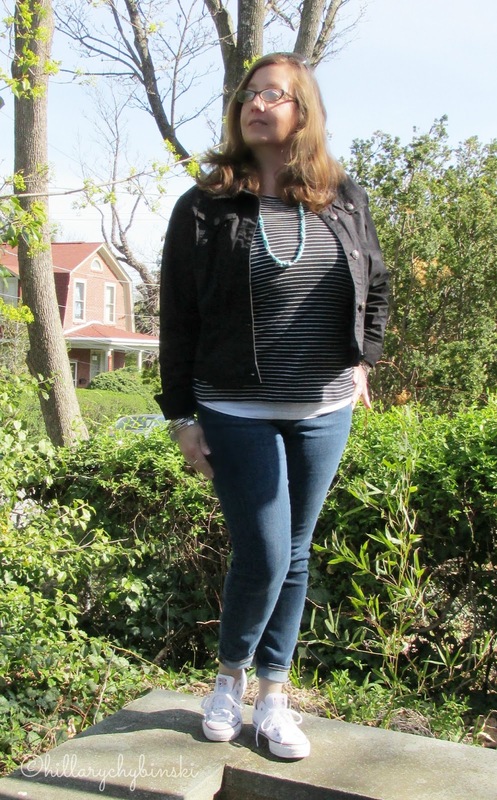 Welcome to another weekly fashion post, where I share real fashion for real women. Each week, I highlight at least one outfit that I'm wearing right now, as well as provide ideas and inspiration to help you get dressed in the mornings. Life is hard, getting dressed shouldn't be. 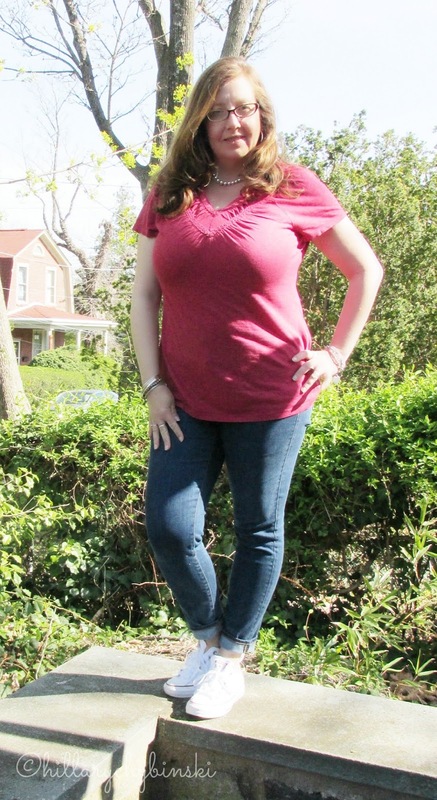 This week let's talk about how to style everyone's favorite basics: a t-shirt and jeans. There is probably no more American clothing than a basic t-shirt and a pair of jeans. But this favorite stand-by doesn't have to be basic or boring. These days, t-shirts come in a wide variety of colors and textures. Many have embellishments and design details that make them more of a "blouse" then a basic t-shirt. 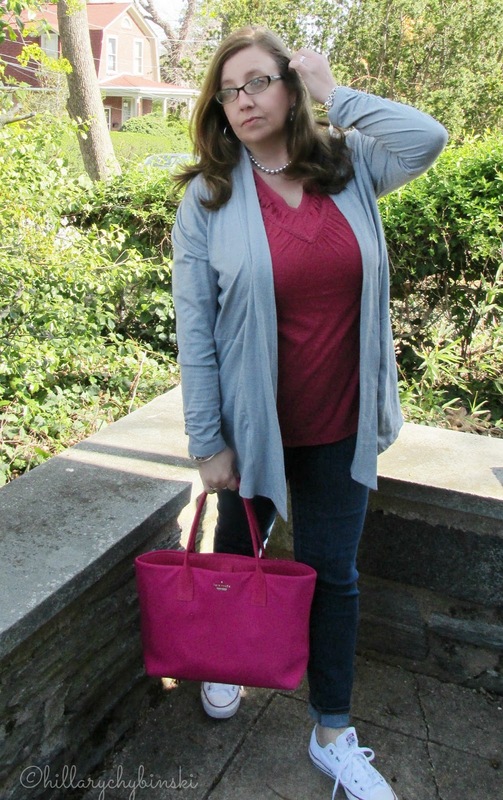 In today's post, I'm featuring several pieces from my Spring Aventura Clothing Ambassador partnership. One thing I need to pay attention to when I shop for t-shirts, is the weight of the fabric. Many t-shirts are made of a very thin cotton, and that just doesn't work on a curvy girl. To help your t-shirts look their best, be sure to invest in a great seamless bra that fits you really well. I also like to put an Aventura Brienne Tank under mine for a band of color at the bottom and a smoother fit around my mid-section. I also have a cardigan or jacket with me almost all the time, even in the summer, when the air conditioning can be unpredictable. I love this thin cotton wrap from Aventura Clothing. I typically prefer a v-neck t-shirt, as it helps minimize my chest and elongate my torso. Even a tiny bit helps. But sometimes you just need a basic round-neck tee. So I added a long necklace in turquoise to make it pop. 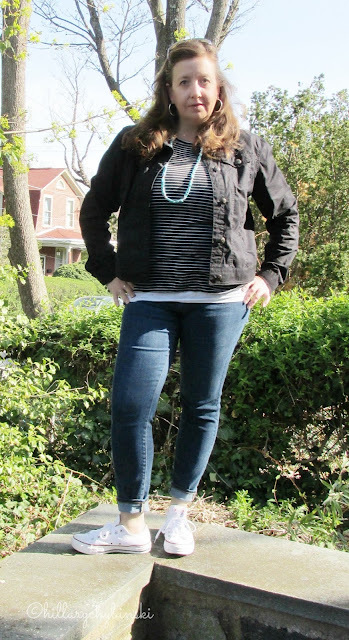 For this outfit, I pulled out one of my Redford Jackets from Aventrua Clothing. I have one in black and one in white, and I love how they are so soft and easy to wear, but still styled like a classic denim jacket. They look great with a t-shirt, but also pair well with dresses and button-down shirts. How about your jeans? There are probably as many jeans as there are women. But simply picking a darker wash or a different cut, can really dress-up your outfit. Add a pair of block heels and a blazer to dark skinnies for a night out. Put on your favorite Chuck Taylors and a denim jacket with a comfy pair of boyfriend jeans for an afternoon with the girls. Don't underestimate the power of great jewelry and a fabulous bag to raise the level of style on your basic tee and jeans. How do you like to style your jeans and t-shirts? I love all of these looks, especially with the chuck taylors!